Dimitris Lakasas, a skilled and adept entrepreneur, was born in 1973 in Pieria, Greece. 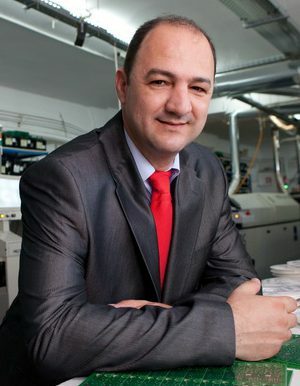 He is the CEO & Managing Director of Olympia Electronics S.A., the market leader in the Greek electronic safety and security industry. The company, the first in Greece and among the top 10 in Europe, is active in developing innovative electronic safety and security systems by using state of the art technology. Olympia Electronics currently employs 174 people with 10% in R&D and its products are exported to 72 countries worldwide (European Union, Eastern European countries and Russia, Middle East and Gulf states, Africa, U.S.A.). Mr. Lakasas, who is an M.B.A. holder from the University of Sheffield with a BSc in Economics & Marketing from the City College – University of Sheffield, has served multiple roles throughout his career in celebrated institutions, some of them are: Member of the Federation of Industries of Northern Greece (FING) since 1999, VP of the Institute for Strategic Development of Pieria, second VP of the Greek International Business Association (SEVE).